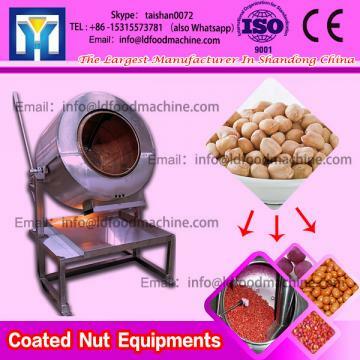 Peanuts Roasting And Coating Machine is a special equipment for processing peanut coating machine. The surface of processed peanuts is smooth and meets the standards of export processing. It has stable rotation, low noise and no pollution. commercial Roasting And Coating Machine is a special equipment for processing peanut surface noodles. The surface of peanuts processed by this equipment is smooth and can meet the export processing standard. It has the characteristics of smooth movement, low noise and no pollution. It can make fish skin peanuts. Chocolate peanuts, multi-flavored peanuts, Japanese beans, full mouth, crispy fruit, shrimp crispy beans, spicy beans, dinosaur eggs and other products. Coated Nut machinery is a special equipment for processing peanut surface noodles. The surface of peanuts processed by this equipment is smooth and can meet the export processing standard. It has the characteristics of smooth movement, low noise and no pollution. It can make fish skin peanuts. Chocolate peanuts, multi-flavored peanuts, Japanese beans, full mouth, crispy fruit, shrimp crispy beans, spicy beans, dinosaur eggs and other products. Massalfa specializes in producing all kinds of commercial nut roasting equipment: multi-functional peanut baking machine, peanut peeling machine, peanut screening machine, peanut fruit washing machine, peanut half-grain machine, peanut fruit classifier, peanut cooling mill, peanut butter production line; Peanut production line, peanut packaging line, peanut chopper, garlic peeling machine, dehydrated garlic dryer, strawberry cleaning, selection line, dehydrated vegetable dryer, microwave dryer, carrot cleaner, multi-function roasted seeds and nuts machinery, baking Furnace, drenching machine, conveying, selection, classifier, grain dryer, vegetable washing machine, etc. Massalfa specializes in the manufacture of According to the needs of customers, we provide on-site exploration and design workshops for our customers.machinery. The company has created a first-class after-sales service with strict and standardized management system, excellent products, first-class production equipment, and sales network throughout the country. It has been widely praised and strongly supported by customers. Looking forward to the future, the company's products have spread all over the country. All over the place. Products meet national export standards. It is sold well in dozens of countries and regions such as the United States, Southeast Asia, Europe, America, Canada, Argentina, and Australia. Main use: It is used to make fish skin peanuts, chocolate peanuts, multi-flavor peanuts, Japanese beans, full mouth fragrant, crispy fruit, shrimp crisp beans, spicy beans, dinosaur eggs and so on. This machine is a special equipment for making peanut surface noodles. The surface of peanuts processed by this equipment is smooth and smooth to meet export processing standards. It has the characteristics of smooth movement, low noise and no pollution. It can make fish skin peanuts and chocolate peanuts. More than ten kinds of rice, multi-flavored peanuts, Japanese beans, full mouth, crispy fruit, shrimp crisp beans, spicy beans, dinosaur eggs. Various electric nut roaster production lines: halogenated peanut production line (cage peanut production line), spiced peanut production line, alcoholic peanut production line, fish skin peanut production line, sugar coated peanut production line, multi-flavored peanut production line, chocolate bean production line, peanut butter production line, sesame sauce production line, Peanut dew, walnut dew, almond dew production line, almond peeling, debitter production line, walnut deep processing production line, peanut sugar production line, garlic deep processing production line, macadamia fruit production line and other nut roasting machine production lines. Various commercial Roasting And Coating Machine single machine: peanut baking oven, peanut dryer, peanut oven, peanut washing machine, sesame cleaning and drying machine, radish, potato, sweet potato washing machine, walnut baking machine, almond baking machine, sesame baking Machine, pistachio baking machine, cashew baking machine, cashew nut shelling machine, macadamia fruit baking machine, big ginger washing machine, peanut fryer, peanut wrap machine, cocoa bean sugar machine, yuan machine, peanut screening Machine, peanut grader, peanut peeler, peanut sheller, peanut mill, peanut chopper, peanut mill, peanut slicer, scallop, fish scale washer. Designing the best process for customers, truly saving time, effort, cost, and high efficiency. The technician is responsible for the installation, commissioning and training of technicians. The Formulation Research Department gives the customer a free food formula and guides the customer until the finished product is made.